Now here's a summer movie to get excited about. The dog days have come to France, and all Parisian secretary Delphine (Rivire) wants is the perfect vacation. But two weeks before the holiday begins, her traveling companion cancels. What to do? From this simple setup, the late, great Eric Rohmer shapes a masterful pastoral comedy, which BAM is screening in a new print in honor of the film's 25th anniversary. The title is a reference to a Jules Verne novel featuring an elusive optical phenomenon that will supposedly provide enlightenment, and Delphine is seeking something similarly miraculous. Back and forth she goes, from her cramped apartment to the oppressively wide-open countryside, from the suffocating city to the no-less-alienating seashore, hoping for an unattainably flawless confluence of people and place. 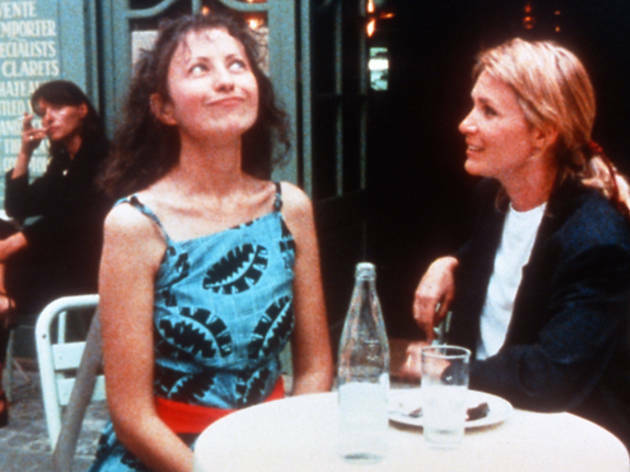 Like many a Rohmer protagonist, Delphine's a talker; early on, she gets into an exasperating argument with some acquaintances about the virtues of vegetarianism. We admire her committed pluck, even as we'd like to shake some social sense into her. Yet for the empathetic Rohmer, her staunch beliefs (especially when it comes to finding the right man) are nothing but admirable, and we, too, slowly come around to her way of seeing things. Much of this is due to Sophie Maintigneux's expressive 16mm cinematography---Rohmer's films always make evocative use of landscape to counterpoint and clarify his characters' emotional states---and to Rivire's superb performance, which is specific in every gesture (her get-me-out-of-here glances during one extended dialogue are skin-crawlingly exact) without ever seeming contrived. But it's the by-the-ocean-at-sunset finale, arguably Rohmer's finest conclusion, that casts Delphine and this sublime work of cinema in a revelatory new light.